During the throes of modern life, it is easy to lose ourselves in our daily chores, occupations and moments of liberty. The demand for our time as we get older becomes ever more engrossed by what we are expected to do but these expectations are usually projected onto the situation itself. We fret, we become stressed, we consume excessively to sate this internal turmoil and recover, repeating the cycle time and again to ease any discomfort. It is understandable why we become upset at times, based on so many factors being out of our control. Yet to be mindful of this and to manage any possible outcome with detachment is perhaps the key to maintaining a consistent and positive disposition. Which leads me to my voluntary involvement in Stoic Week 2013, an online event (with offline study and activity) organised by academics and psychotherapists running for its 2nd year. The main purpose was to encourage members of the public to engage in Stoic teachings and reflections with the view to explore its potential benefits within modern life. It was perhaps not the most practical week to abide by Stoic standards due to social occasions as well as work-related gatherings however much like the philosophy itself, that which is out of our control is not something to concern oneself with so I could at least focus on what was within my control and be mindful of my approach instead. The Stoics central focus in life was simply to be virtuous, of ‘good’ character. As stated in the gratis handbook I was provided with, it is a vision of maintaining a ‘rational’ persona, ensuring an excellent mental state. This mental state is the only thing that really matters in order to survive well as a human being and without making a conscious effort to preserve it could mean never being truly happy. The focus must be inwards rather than outwards. Seems logical, but how truly mindful are we? We are led into a false belief that by owning material possessions we gain more peer approval and therefore exercise a consumerist attitude stemming from luxury rather than need, directly feeding the media that we daily criticise. So for 7 days I looked to monitor aspects of my day and ensure I continue to practice a more mindful attitude, exploring a more inward viewpoint prior to application, looking to benefit the community of humankind and increase interconnectedness. MONDAY: What is in our Power? By simply accepting that should I be beset by uncontrollable aspects to my journey, I ride calmly, thankful for the still winds and sunshine that ease my commute that day and the fresh air in my lungs. I consider only the aspects within my control, that I can personally take responsibility for. The rest is superfluous. Seneca provides a quote in the evening reflection which is especially touching as we most certainly forget that simply by waking up in the morning, we live another day. This was my morning reflection, self-scribed and inspired by a text written by Seneca on the Shortness of Life. It reminded me to be mindful of all my actions today. I awake early to run and energise my body for the day’s undertakings, working my heart to pulsate defiantly at the start of another new day. I have always relished rising early for a run, there are substantially less people on the streets so you have more room to move and the fading darkness provides a pleasant coercion into the day. I read more this morning and absorb each word carefully, journeying into work with wider eyes and further inspiration in mind for a creative day ahead with my intern. I spend the day interacting frequently, in social and written context, which stimulates more creative thought and ideas and I continue to be aware of my colleagues, enquiring into their disposition with a genuine curiosity. I am mindful once again returning home to prepare lunches in advance for work and continue to read voraciously, eager for the days to come and provide more insight which all seems to articulate a mind-set I nurture already. My mind is crackling with alertness and I begrudgingly fall asleep. Marcus Aurelius, a much revered Stoic and writer of the Meditations which I had previously read and provided the opening reflection for today. Today’s encouraged mindfulness is to be on the subject of events yet to be and how the act of acceptance of whatever is to be is simply acknowledged and accepted, regardless of outcome. This is another mind-set that I eagerly look to practice daily; the past can haunt us and the future can instil doubt however either of these phases in our life are outside of the realms of our control. What is within our control is our conduct towards it, so my path is to focus on gaining serenity. It should be “for the common welfare” of mankind, which perhaps comes closest to what we mean nowadays by saying that something is “ethical” — taking into account the wellbeing of others as well as our own, as if all of mankind were part of a single family. It should be “according to nature”, meaning that some things are naturally worth pursuing and preferring over other things, both for ourselves and others, such as physical health, although these things are not considered intrinsically “good” in Stoic ethics. From reading today’s text I realise I always seem to preempt unfavourable outcomes, not aloud or in order to form a pessimistic attitude. On the contrary, it is to gain a pro-active acceptance for whatever the outcome is. By walking to work today, I pre-empted traffic and delays so allowed adequate time and the weather was agreeable. By taking a walk (within my control) I avoided unnecessary delays from external events (outside my control) and arrived on time and refreshed from morning exercise. A blood donation appointment (within my control) affected my physical behaviour from depletion of energy (outside of my control) however avoiding the full attendance of a work-related soiree later on and ensuring regular food and drink was consumed (within my control), I was able to ensure a healthier disposition. Contemplating on this made me realise that we must quite frequently do things out of obligation that is in fact detrimental to our well-being which can ultimately hurt others if our constitution is weary, so first and foremost it is imperative to be respectful to ourselves in order to be fully mindful, therefore able to interact positively with others. To do more of what strengthens your positive habits (practising music makes you a better musician, reading makes you a more literate writer) is essential. My reflection for the day is “Detachment to fate’s unpredictable hand is imperative for good character. The pass IS obsolete, control over the NOW is active”. Once again Marcus Aurelius is the morning mentor, which comforts me to disperse any clouds of malice that form, particularly upon cycling to work and whilst mindful of my own conduct on the road am not responsible for retorts of fellow cyclists (comment from one to watch where I’m going. A judgement which is outside of my control and therefore void in my opinion). So I seek with fervour continued teachings from today’s reflections which includes a quotation from Epictetus “It is not the things themselves that disturb people but their judgements about those things”. I wrote a blog post recently on the subject of Judgement and its unnecessary presence in most conversation, however based on our natural defence mechanisms and need to compete there are elements of this that prove hard to avoid. This is the purpose of today’s exercise though, to practice a mindfulness not to judge, to pause and consider one’s actions in order to meditate on response to the subject. Through practice and self-motivated cognitive awareness, we can modify automatic reactions of defensiveness to instead become positive support and nurture, to ensure nourishment of character rather than depletion. The reflection today by Marcus Aurelius resonated quite closely with me as this year in particular has been (what I would consider) the most emotionally turbulent of my life. I have been able to manage my cerebral reactions positively through from the impact of my Mother’s death, as well as other potentially psychologically stressful situations. I have maintained the rationale which borne itself in my thought process since when my Father died. As fortune seems to grant, it is only when we have suffered through catastrophic events first hand that we can truly empathise and therefore begin to hone this clarity gained. I recollect scenes which I thought I understood (having not personally experienced them) possessing a blind folly in the belief I could have assumed such understanding. The objective of today was to consider how one would react potentially and almost enact the future scenario in our minds, thereby exposing our emotional state to its possible challenges, working through them and ultimately embracing the outcome as unavoidable yet able to see it through in its entirety. I confess that prior to my Mother’s (unexpected) death, I frequently enacted the process in my mind (not the particulars, just the loss itself), even at points discussing important key practicalities with my Mother such as a will or paperwork. I needed to be aware of certain details in order to process the logical side as it can be hard to detach from the emotional during the event itself (which I later found out first hand. The emotional intensity during bereavement is quite overwhelming so there must be allowances made for administrative practicalities to be seen to during minimal strength of mind. Friends or family members than can assist are also essential). Posthumous existence for the living of the bereaved is considerably harder than you can ever anticipate, BUT it does abate, with time. It seemed quite apt that the night before I had been made aware of a radio show, where once a week a contributor, Steve Evans, discussed his situation with listeners and his friend (the radio presenter) on the sobering subject of his terminal stomach cancer. Here is a man who has a wife and children, is unlikely to live past Christmas (although is humbly grateful for whatever time he has to come) yet manages to discuss in bewilderingly positive honesty about his remaining time on this earth, how it is all going and more importantly to inspire the living to LIVE. From a clip of his podcast, he mentioned the subject of whether relatives found it awkward to discuss a loved one’s illness due to fear of upset etc. He encouraged dialogue and that the sick needed to have the comfort of knowing they will be missed and that it is a painful process. Logical information but necessary to reiterate that by discussing internal thoughts and making them manifest in reality, we grow stronger and more resilient which ensures we are able to continue rising each day. At one point in the day I feel overexposed with a desire to withdraw however this is due to excessive consumption of toxins the night before (within my control) which led me to more melancholy thoughts (also reactive to overheating and minimal time for concentration, both out of my control). I acknowledge this by taking a break for five minutes and gathering my thoughts, as well as listening to beautiful music. Within the hour I will be free of employment shackles so I need not fret as the inevitable passing of time will occur. Everything is temporary. Thought for the day from me is simple “When pondering any concern, our own mortality is a reminder. Death is unavoidable. We are finite & so should all anxieties be”. Today’s reflection seemed befitting that I would later be attending Stoic Week’s event at Birbeck University, putting myself amongst others, connecting mentally for the shared purpose of searching for truth. Existing in surroundings that bustle with large groups , it is easy to understand how we become territorial, almost possessive of our own individual selves and spaces, creating mini kingdoms so we can reign as monarchs using tables at restaurants, seats during our commute and restricted areas to demonstrate it. This sometimes enforced segregation though is detrimental to our overall assessment of our positions on Earth. We are a community, we are born to co-exist in order to multiply and strengthen. To go against this basic philosophy is to go against nature. My thought for the day began as such: “Just as Nature sustains us (internal networks working cohesively so we can live) so should our bodies serve nature, by serving EARTH”. I formulated this sentence whilst pounding the earth itself on another bout of physical exercise in the morning, my quiet time to reflect on the day before and ponder the day to come. As my body moved, limbs pacing forward, heart beating faster, sweat forming as time progressed in tune to music, I was even more aware of its purpose to serve my entire being. A collective system of cells, bones and bodily functions were serving my whole vessel, my body, unitedly in order for me to exist, to live. Which is exactly what each individual on this planet was formed for too; to live for each other. To inflict regulations, expectations and personal doubt onto others can only result in negative impact so we must remove ourselves and the application of ego within all situations. Unconditional love is divine and when practiced is incredibly rewarding as if the resulting situation be agreeable, it serves only as a pleasant occurrence rather than an unrealistic aim. We all know someone, perhaps even counting ourselves into the equation, who has been affected by negative circumstances; a failed romance, verbal or physical abuse, bereavement. The resulting factors of such emotional drains can result in a sense of victimisation, the ‘Why me?’ question, seeking justification. We debate internally as to how it could have happened in the first place, believing we created the perfect test environment for only good outcomes to prosper. Whilst a scientific approach certainly has a place within philosophy, with its rationale and application of method in order to build a body of knowledge, we must not forget that all aspects of any experiment are changeable. Whilst a contribution might be as controlled as possible we must not inflict this expectation on the subject. Which is why a Philanthropic attitude is essential in modern-life or else we expose ourselves to discrimination, bigotry and a general delusion for mankind. We cannot categorise one culture based on a single individual, we cannot belittle a gender based on the actions of one person. So we must encourage good nature by seeking to love others regardless of expectation, knowing that the consequence of loving them is not up to us and that they can be taken from us at any moment. 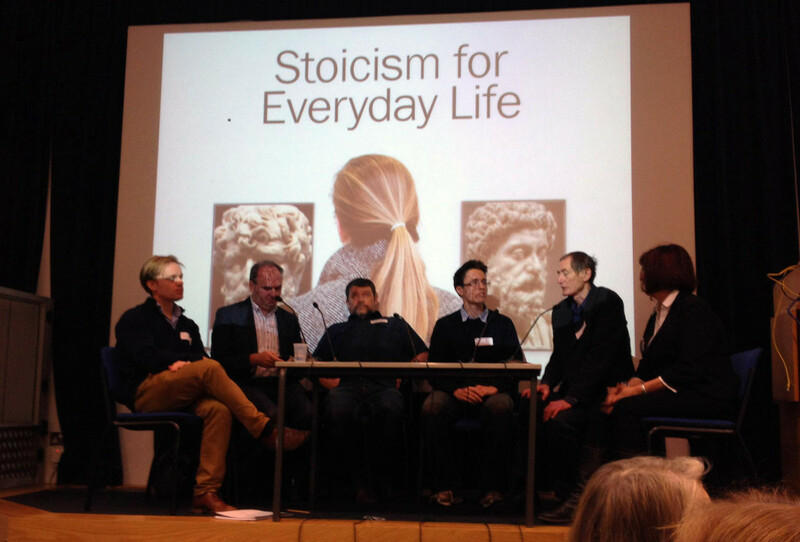 The Stoic Day held at Birbeck University was quite inspiring for me, observing over 200 attendees of all ages and backgrounds (some academics and medical professionals, some students, some just curious). I sat in the pews of the lecture room eager to absorb the words from ‘experts’ on the subject of Stoicism and how it can be applied in our lives today. They reiterated the basic principles of this philosophy and debated Stoic perspectives, never losing sight though that we fundamentally all have the capacity to produce our own happiness by regulating the virtues we possess and seeking to improve upon the ones we may lack. In line with the philanthropic theme of the day, we were also informed on Stoic Week events engaged in worldwide in places as far as Thailand and Brunei, a global community of over 2000 people’s participation. Workshops were also part of the day and I chose two in particular ‘Stoicism & Positive Psychology: Ancient Wisdom meets Modern Science” hosted by Tim LeBon and “Stoic ‘Mindfulness” with Patrick Ussher. I had remembered attending a Positive Psychology at Work course run by the CIPD which I believe is something that should be considered as part of the development of any employee. By refocussing the mind on practical exercises to encourage a positive attitude is an excellent philosophy to abide by. This is something that Tim mentioned, as one can confuse a positive mental attitude as ‘new-age’ thought, something found in glib self-help books where by solely thinking a positive thought you encourage positive outcomes. This is not Stoic though as the philosophy encourages practical application too. You must be active to engage both mind and body in order to achieve a positive psychosis, from diet to meditation. Which led suitably to the next session, to encourage a mindfulness in all that we do, to mentally prepare ourselves for a difficult situation as well as reminding ourselves to distance ourselves on it. It is not to say the situation will transpire, but we ready ourselves, remembering we are merely an impression on the situation, not the situation itself. As simple as it might be, it is very easy for us to lose sense of perspective of ourselves, within the grand scheme of things (as the saying goes). We become lost in the trivial pursuits, focussing on detail rather than stepping back from the painted canvas of our lives to reflect upon it and explore new angles that might suit it better. As I arose from a foggy mind driven by overactive cerebral function once again, I began to lose sight of my purpose to serve, to contribute to this vast universe. So I took a bath. Something as simple as submerging oneself in hot water is inexplicably beneficial for the mind when trying to regain perspective. You are exposed to your unique body, forced to view your naked flesh in its solemnity and no longer have to consider the unconscious rituals of wearing clothes and gravity. You lay, womb-like and stare out, whether at a wall, the window or an object in the room. From there you can then start to withdraw out of your being, considering the outside of the room, the house it forms part of, the street that the house is on, the City that the street connects up with other streets upon, the City’s position within the country you live and the country’s place on the planet we all reside. I wonder if the fascination with infographics of late lies in its simple translation of common knowledge, allowing us to see how we all fit in this massive grid of humans on this even more massive expanse of Earth. This short film also helped me gain insight into the view from above at the beginning of the week, reminding me that we are all such delicate and passing creatures, we must never lose sight of this. It does not negate our existence, on the contrary, it validates our need to be the best we can, to make a conscious effort to value our individual place on the planet. My reflection from the day was articulated finally as “Our eyes should be used to magnify the world around us; visual perspective to remind of our physical relativity in the universe”. 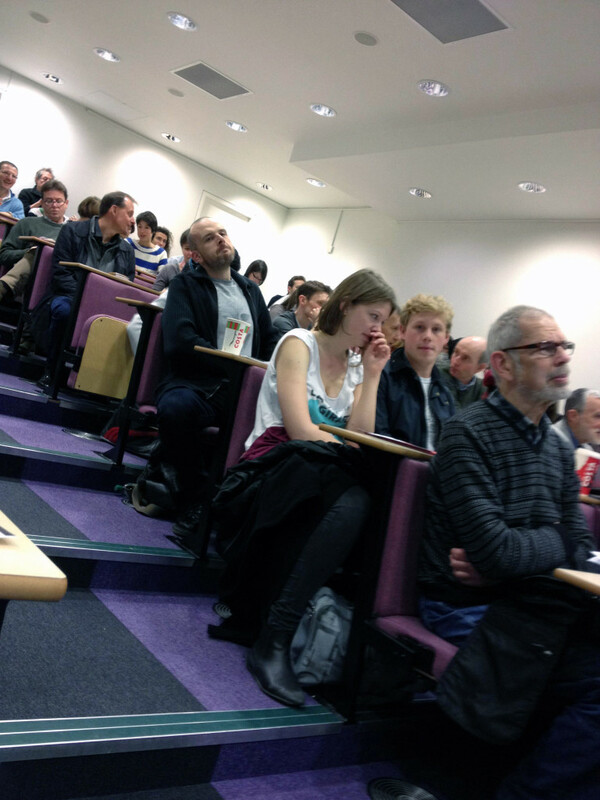 At the end of the event on Saturday, when discussing with the audience their views on whether they gained any insight into their behaviour in line with Stoicism, as well as observing classroom members talk about scenarios in their life and how they would approach the situation, it was clear that Stoicism is indeed not for everyone and not even inherent in their nature. At one session, the chair asked the group to think of 3 positive occurrences that happened to them in the past 24 hours however very few spoke up (I later discussed this with him and concluded that a large contributor to this is a cultural effect, which represses the ability to vocalise good things due to fear of being considered arrogant. I find that within some academic circles too there is a huge amount of cynicism in generating positive psychological thought which was backed up by a suitably cynical peer at the back of the room). I believe without really ever having labelled it (and in some ways I am loathe to now) have been practicing Stoicism for many years. There are definite areas which I am not as committed to, as I do and will continue to become overtly joyful in moments of happiness, but I see this as a virtue to be able to express joy rather than inhibit it. The same for my adoration for music in particular, which articulates what is inside my head in the most profound way, unlocking logic and delivering it in unimaginable ways. Words and thoughts can sometimes be considered inert but from colour produced through sound there is an incredible equilibrium between meaning and the manifestation of. It’s the beauty in its delivery that enables understanding to seep into the soul. So ultimately, as with most Philosophies and ways of thinking, it is about finding out what nourishes you and utilising it, all in the name of becoming a better human being.